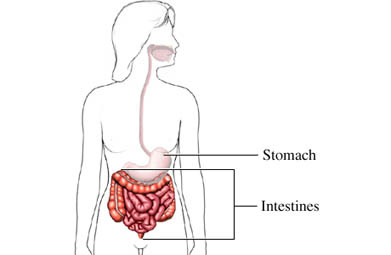 Malabsorption is when the body has trouble absorbing certain nutrients. Not getting enough nutrients from food can cause problems. These problems can happen even when someone is eating as they should. Treatment depends on the cause. Sometimes, it will fix any problems with malabsorption. You may need to make up for lost nutrients. This can be done with food or supplements. . You may need to eat more vitamins, minerals, fats, or proteins. In some cases, nutrients may be given by IV. A dietitian will be able to help you. There is no way to prevent malabsorption because it depends on the cause. Abdullah M, Firmansyah MA. Clinical approach and management of chronic diarrhea. Acta Med Indones. 2013;45(2):157-165. Bacterial overgrowth syndrome. Merck Manual Professional Version website. Available at: http://www.merckmanuals.com/professional/gastrointestinal%5Fdisorders/malabsorption%5Fsyndromes/bacterial%5Fovergrowth%5Fsyndrome.html. Updated February 2018. Accessed August 13, 2018. Chronic diarrhea. EBSCO DynaMed Plus website. Available at: https://www.dynamed.com/topics/dmp~AN~T114891/Chronic-diarrhea . Updated July 1, 2016. Accessed August 13, 2018. Diarrheal diseases—acute and chronic. American College of Gastroenterology website. Available at: http://patients.gi.org/topics/diarrhea-acute-and-chronic. Updated December 2012. Accessed August 13, 2018. Overview of malabsorption. Merck Manual Professional Version website. Available at: https://www.merckmanuals.com/professional/gastrointestinal-disorders/malabsorption-syndromes/overview-of-malabsorption. Updated February 2018. Accessed August 13, 2018.